Trans Canada Airlines was created by the Canadian Government in 1936 to be Canada's Flag carrier airline. As such it was automatically granted licences for Canada's airline routes internally and to Great Britain and much of Europe. In 1964 its name was changed to Air Canada, and it still serves as Canada's premiere airline to this day. TCA bought its DC-8s in 1960 and they immediately started service on the major international routes TCA served. 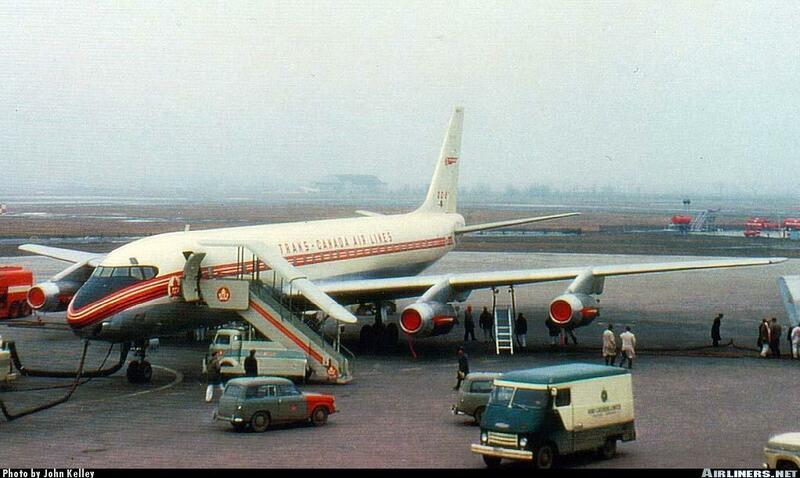 The DC-8 was the flagship of the fleet until the 747 was introduced in 1971. Vintage Flyer Decals is a cottage industry producer from California. The decals are printed on a laser printer and an ALPS printer for those colours the laser won't do (mostly white and silver). This allows Vintage Flyer a great deal of versatility in the colour schemes they can produce and uses the stengths of both printing methods to best advantage. This decal is intended to fit either the Revell kit (if it can be found) or a cut down Minicraft kit with Contrails engines (more on these engines below). The TCA DC-8 decal set comes on 4 seperate sheets, which I have arbitrarily numbered from 1 – 4. This sheet contains the white underlays for those elements of the colour scheme that go on the bare metal portions of the aircraft. Careful attention must be paid when painting to ensure the divide between metal and white is in the correct location. This sheet is the largest and most colourful. It contains the major elements of TCA's colour scheme in red, black and light grey. On this sheet are the cheatlines, titles, tail logos, registrations, engine logos, windscreen, windscreen outline. There are also decals for the airstairs which came in Revell's kit. This sheet has the cabin windows and black pinstriping which combines with sheets #1 & 2 to form TCA's intricate cheatlines. These decals call for patience and care to ensure that they're layered correctly without slipping or stretching out of position. The TCA scheme requires the cheatline to wrap around the nose, always a difficult proposition. It is to be hoped that they will respond to setting solutuions without wrinkling or distorting. The nose will be the acid test for these decals. Lows: Multiple layers need extra care.